Do you ever encounter particulate or water contamination at your power plant? A power facility in Canada had been renting a 50-GPM vacuum dehydrator from us to purify the oil lubrication system of one of their four power turbines. 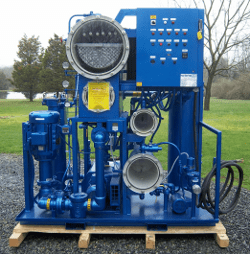 Our basic filtration rental system performed so well for the customer that they decided to purchase a custom-built 50-GPM vacuum dehydrator to purify AND remove the water contamination from ALL of their turbines’ reservoirs. This particular customer ordered brand new vacuum dehydrators with in-line particle counters, in-line digital moisture indicators, and automatic water drains with an extra pump to carry the collected condensate into a separate storage container for proper disposal. We look forward to hearing how these vacuum dehydrators help the power plant to achieve their target ISO cleanliness codes as well as improve the reliability of their machinery. Of course, we’ll post something once we hear some results.